Over the course of history, we have been unaware of a presence among us. 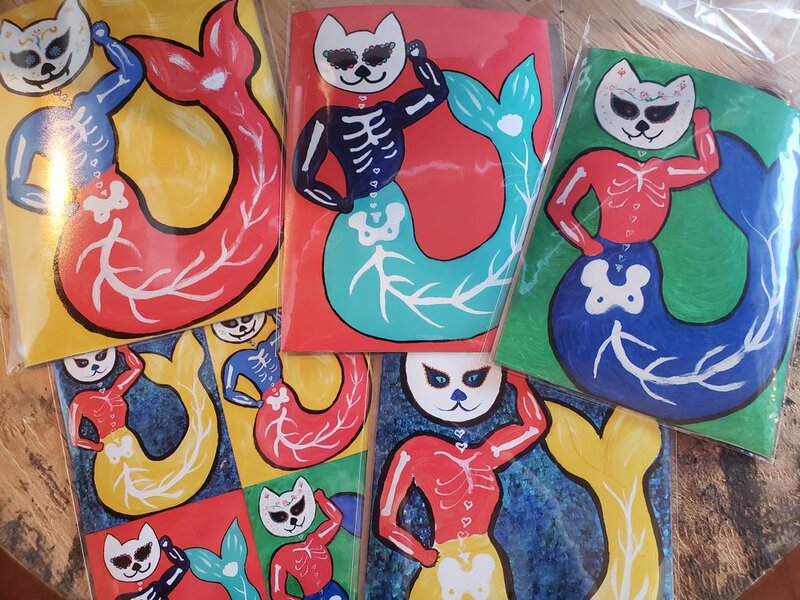 According to Sissy Rose, the ‘Mercat’ (mermaid+cat) swam with the Dinosaurs, partook in medieval medicine, and witnessed the salvage of ancient amphora in Greece to name a few occurrences. The Mercats are felines of many faces. From Tabbies to ‘Frittens’ they have an array of colors and unique physiques throughout the species. From a Tiger Shark in a literal way to kitten guppies, the Mercats range from cuddly to dauntingly formidable. Seen here, we have the Dias De Los Mercats in the colorful regalia and sugar skull decor. Cards and prints are available of these and most of her fantastic assemblages for artistic gifting. Lucky for you, the Ozone houses the largest collection of Mercats (not unlike a Mercat Museum) spare Sissy Rose’s private collection (and who knows what lies in the secret vaults of the Smithsonian). Come browse the variety of scenarios that have played out over time with the Mercats and share a few giggles with us.